It’s a side of life Westporters seldom see, but contractors and laborers here know well: pick-up points in places like Norwalk, Bridgeport and Stamford, where builders and workers connect every morning. Bosses are never sure what type of workers they’ll get. Workers are never sure if they’ll be paid what they’ve been promised. It’s a risky, inefficient dance. A new app may revolutionize the entire process — all over the world. And it was born right here in Westport. Joe DeJesus is a 1981 Staples High School graduate. A builder himself, he’d long been frustrated by the process of finding skilled, reliable carpenters, electricians and others to work on his projects. A couple of years ago he used Uber for the first time. He realized the on-demand idea could work for laborers too. He pitched the idea to Andre Haroche, a friend who had brought Liberty Travel into the digital age. He signed on as co-founder. For $1,000, coders in India created a prototype. Convinced they had something, DeJesus and Haroche plowed ahead. 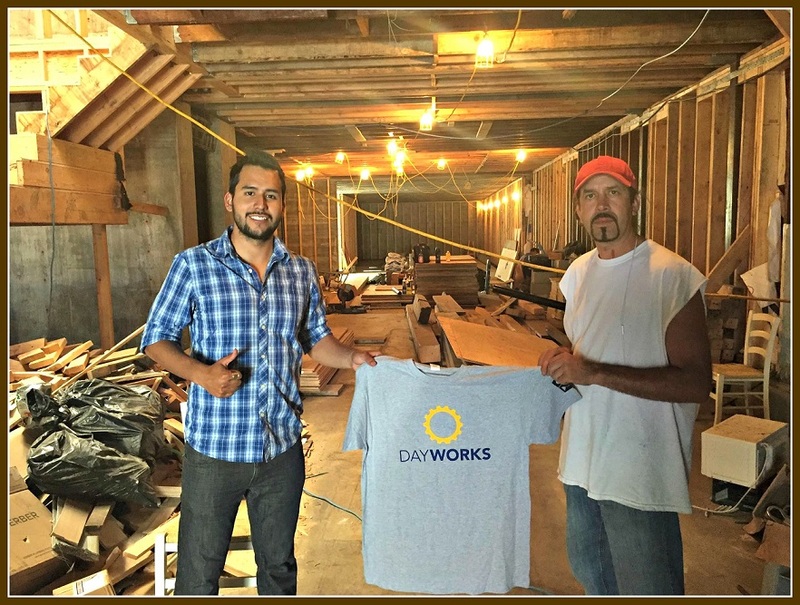 Dayworks launched locally, in the Port Chester-Danbury-New Haven area. The idea is simple. After downloading the app, workers list themselves for free. They note their specialties (plumbing, HVAC, masonry, painting, tile setting, wood flooring, etc. ); the languages they speak; the minimum number of hours they’ll work: their rate. and how they want to be paid (cash only or check); whether they have a ride or need one, and if they have a license and/or insurance. Workers can post photos of themselves too. Coming soon: video. Bosses — both builders and individuals with home-improvement projects — can search for workers by skill. Clicking one button completes the hire. Builders and laborers connect through Dayworks. A boss can also post an entire project, including conditions like start and end date, maximum hourly rate, and whether English is required. Workers can respond immediately. Bosses rate workers. And workers rate bosses. It’s a win-win situation, DeJesus says. For one thing, it takes the uncertainty out of the pickup-site process, which is both time-consuming and uncertain. For another, it offers a transparent way of offering — and seeking — pay. Rates are often standard at pick-up sites. With Dayworks, bosses can offer a bit more to clearly qualified workers. Workers — who sometimes miss out on jobs because they’re pressured by peers to not ask for less than the prevailing rate — can increase their chances of being hired by pricing themselves accordingly. Much of the growth has been by word of mouth, and YouTube videos (created by Westport’s own Bobby Hudson). Flyers — in English and Spanish — are also handed out at job sites. But Dayworks is not just for builders and tradesmen. Other categories include house cleaners, automotive (mechanics, detailers, etc. ), boating, restaurants (dishwashers, barbacks, busboys) and catering, tech repair, even personal trainers. Joe DeJesus got the idea for Dayworks from Uber. Soon — like the revolutionary car service — his labor finding-and-sharing app may be everywhere. And maybe — like Uber — it will even be a verb. This entry was posted in Economy, People, technology and tagged American laborers, building industry, contractors, Dayworks, joe DeJesus. Bookmark the permalink. I have hired 3 different people on Dayworks and they have all been great! My favorite is a carpenter who used to be a GC who spent 2 days just fixing all the little stuff in my house – loose cabinets, creaky stairs, touch up paint, railing work… Great App! Great Service! I am guessing that Joe DeJesus is Joe Jr.,. Joe Sr. was/is a contractor in Westport, too, and the husband of Bambi Lynn, who danced on Broadway and/or in the movie, “Carousel”. I remember that Joe DeJesus remodeled a derelict old farmhouse on Hillandale Road, near Center Street in the early 70’s, transforming it into something beautiful. It was later bought as a second home by a New York designer, I think. It’s still a handsome residence. Correct, Joyce. And Joe Sr. also taught ballroom dancing here! A great couple. Both are still alive and well. I remember Joe Sr. as well. My father and I used to work with him on housing projects. A great guy!